Blissfully Blessed: A guest post and delish recipe! I am so excited for my first guest blogger because she happens to be my little sis! She is such an amazing cook and baker. And her recipes never leave you feeling guilty because they are all extremely healthy. Thanks Carley! I am so glad to be doing a guest post for Blissfully Blessed. I follow this blog faithfully and am always so impressed by how creative Nicole is! I am the resident nutrition blogger for the gym I attend, Crossfit Lakecity in North Idaho. I and almost everyone at the gym eat a Paleolithic (Paleo) diet. I use the term diet very loosely because eating Paleo is a lifestyle change, not a thing you do for a time to lose weight, although it will help with that! Paleo goes by several other names, I'm sure some of you have heard of "eating clean". Paleo is very similar to clean eating, it is just squeaky squeaky scrub it some more, clean. The basic concept behind Paleo is eating as they would have in the Paleolithic or caveman era (I've heard Paleo be referred to as dino chow or primal eating). In a Paleo diet we eat meat, veggies, fruit, nuts and seeds and natural oils. And that is it, no dairy, sugars, grains, processed foods, chemicals or dyes, beans or legumes. We call all of the before mentioned foods poison, that might be a little bit of an exaduration, but all of those things have adverse effects on our bodies and are nearly impossible for our bodies to use as fuel to help our bodies function at the best possible levels. Basically if you can pick it or kill it, you can eat it. I have been eating a Paleo diet for 1.5 years and I love the health benefits that I have experienced! Through eating this way I sleep better, my acne is 95% gone (aside from that 1 special time of month, sorry men readers!) my performance in the gym has greatly improved, I am stronger and faster and I think the best benefit is that without even trying I lost over 15 inches in 6 months! Some people who greatly benefit from eating a diet like this are people that have food allergies, gluten intolerance or Celiac disease. It is a little hard at first, but think about giving it a try. I assure you that you will feel better and notice changes in your body composition very quickly! One thing that scares people away from trying a new way of eating (diet) is that they are afraid of losing their favorite foods or possible eating foods that are un-appealing to them. Cooking Paleo once you are used to it is so easy! You can modify almost anything to make it clean. Things like using honey instead of sugar, almond flour instead of flour, coconut milk instead of cows milk, spaghetti squash instead of noodles... I could go on and on! I have over 125 recipes on http://www.crossfitlakecity.com to get you started. You will find everything from homemade jerky to meatloaf to cookies and even truffles! I am also posting a recipe here for your enjoyment. I hope that you will try it and be inspired to try a new way of eating, even if it is just a few meals a week you can make a step towards a healthier lifestyle. Make your dressing by combining all ingredients and whisking together. Set aside. Cook the bacon and crumble it. Set aside. 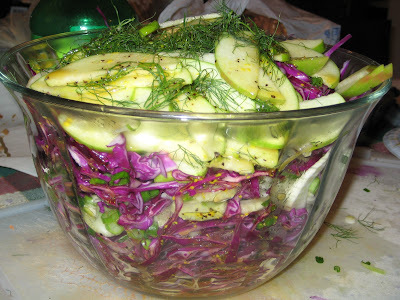 In a large bowl slice the cabbage finely and place in the bowl. Slice the green onions fennel and apple and add to bowl. When cutting a fennel, cut it right at the base of the stalks and slice it, it will be similar to celery. You use the bottom part and not the stalks, don't forget to reserve the fennel fronds! Add the dressing and toss to coat. Add the bacon crumbles, cranberries and fennel fronds to the salad and serve! I'm up for trying something new! Looks like an adventure! Thank you for linking to Wicked Awesome Wednesday. I have always been interested in the paleo diet...I just don't know how I would fare without cheese! The slaw sounds delicious!